With the advent of big data, our world has become more quantitative than ever. Our ability to collect and process enormous amounts of data has revolutionized almost every aspect of our lives, from medicine to climate prediction, from risk management to marketing strategies. As an applied mathematics major, you'll acquire the tools and methods of the field's main frameworks—probability, mathematical modeling, numerical analysis and differential equations—and learn to develop mathematical models to solve real-world problems. You'll learn to apply this knowledge across many disciplines, including biology, chemistry, economics, engineering and social sciences. In fact, applied mathematics might interest you as a second major if you are already majoring in physics, computer science, biology, neurobiology, economics, or business. The new bachelor of science degree program was developed in response to the need for applied mathematicians to model solutions for the world's most pressing problems. As a well-trained applied mathematician, you will have highly-valued skills that will open doors to career opportunities at public institutions, research centers or private companies that use quantitative methods to understand and solve complex problems. You'll also be well-prepared to pursue further study and a career in academia. Our department ranks among the top departments in the country, but because we're Brandeis, you'll get to work with top scholars who are also dedicated teachers and mentors. We pride ourselves on being a friendly and accessible community, even as we embrace intellectual rigor. Minutes from campus, Boston is a thriving city with first-rate universities, including Boston University, Harvard, MIT and many others, so you'll be able to connect with many other fellow math and science lovers. And because you can't study all the time, you might take advantage of Boston's many cultural offerings, from historic landmarks to live music to modern art. In our program, you will learn to develop mathematical models to solve real-world problems across many disciplines. As an applied mathematics major, you will take electives offered by other departments and programs, such as biology, computer science, neuroscience, and physics. If you're prepared for the challenge, you may pursue a BS degree with honors. To achieve honors, you must earn at least a B in every course and complete and defend an honors thesis. Jonathan Touboul applies mathematical tools to biological questions, including understanding the interplay of structure and function in the brain. Thomas Fai's research deals with the scientific computing and mathematical modeling of complex biological fluids, including the fluids inside of blood vessels and cells. Before coming to Brandeis, he was an NSF Postdoctoral Fellow at the School of Engineering and Applied Sciences at Harvard. John Wilmes received the Outstanding Postdoctoral Research award from the College of Computing at the Georgia Institute of Technology. At Brandeis, John studies the symmetries of discrete structures and developing rigorous analyses of machine learning algorithms. Professor Bong Lian is a principal investigator on a newly awarded Simons Collaboration on Homological Mirror Symmetry. Our applied mathematics majors will be prepared to go on to graduate school to pursue their doctorate, or to pursue careers at public institutions, research centers or private companies. 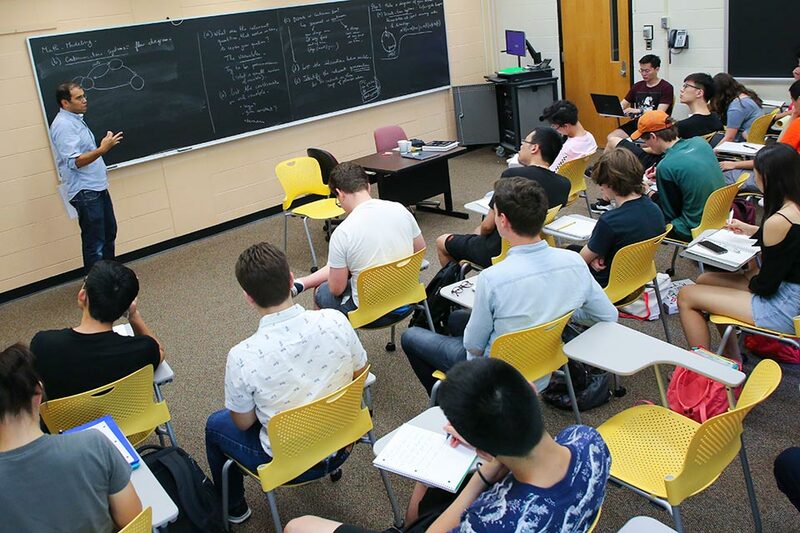 Contact Professor Ruth Charney and An Huang to learn more about the mathematics curriculum and what you would need to do to major in this field.